The 8th Offshore Mariculture Conference will be held in association with the U.S. Soybean Export Council, USSEC, in Singapore, from May 15 - 17, 2018. In the last European edition of the conference in Barcelona, it was highlighted by the FAO chairman that Asia is the hub in terms of quantity and potential, and it needs to intensify with more fish per cubic metre of water. The market in Southeast Asia is now well-primed for large scale/large volume production and the focus for this first Asian edition of the conference will be marine fin fish. The conference has previously enjoyed six successful conferences in Europe, held in Malta, Alicante, Dubrovnik, Izmir, Naples and Barcelona. This March launched the 7th edition in the Americas in Ensenada, Baja California, Mexico in response to the need to grow this important sector worldwide to meet the growing demand for seafood. This highly successful launch, supported by both regional and federal Mexican governments, saw 200 attendees from 20 countries and included high profile investors. The 2018 Offshore Mariculture Asia Conference will be an invaluable platform for networking as it will provide ample opportunities to meet and network with fellow delegates, sponsors, and speakers to knowledge share and move the sector forward. The conference will consist of 2 days of technical presentations and panel discussions from high level experienced operators in the sector. The event concludes with a technical visit to an operating farm, providing delegates with an insight into their inner workings. Organised by Mercator Media Limited, publishers of World Fishing and Aquaculture, the conference will include the latest legislation, investment and financing opportunities together with the day to day practicalities of running an offshore business. 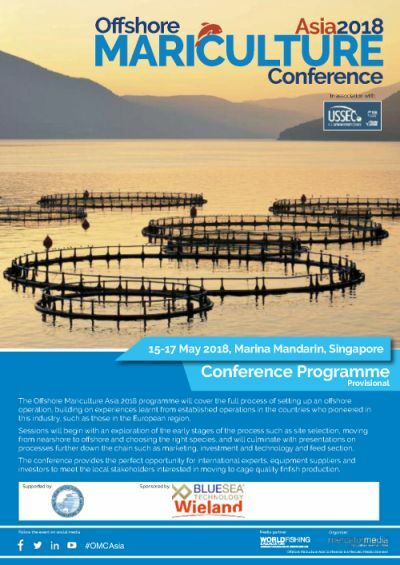 To register or obtain more information please visit the Offshore Mariculture Asia 2018 website or download the programme below.